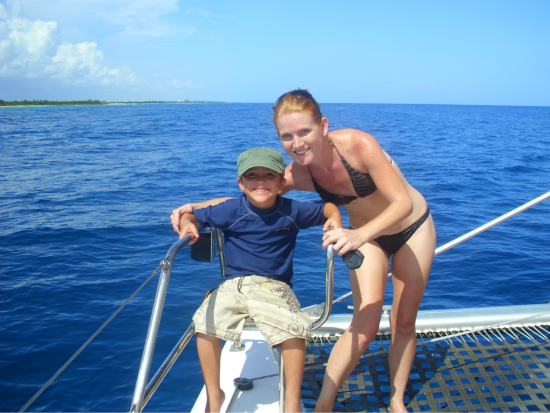 The Fat Cat is an amazing catamaran excursion in the Mayan Riviera. We had the opportunity to board the Fat Cat Catamaran yesterday, and what a great day it was! The catamaran is located in the beautiful gated community of Puerto Aventuras, about 20 minutes south of Playa del Carmen. The 4-hour tour was enjoyable from beginning to end. The staff is amazingly friendly and helpful. We left the marina and went along the coastline for about an hour. We lounged out on the nets out the front of the boat and I worked on my non-existant tan! The drinks were flowing, and the staff made sure we were well looked after. We stopped inside a coral reef, and were provided with equipment. One of the guides took us out snorkeling and we saw loads of tropical fish and even saw a few giant sea turtles! Once back on board, we were served lunch (and more drinks). Lunch is a simple picnic lunch but filling and satisfying. They have sandwich choices of tuna, cheese, and ham and cheese and each sandwich comes with a bag of chips and cookies of some sort. While we were eating we were en route for the second spot for swimming. We docked in an area where there are cool jets from the surrounding cenotes. We were swimming in water that was 28 and 24 degrees simultaneously. Warm arm, cold arm. Cold bottom, warm top. Fantastic. The kids had a great time jumping from the boat in this area. The sun was just beginning to set as we were coming back. Everyone on board came back relaxed and happy. Thanks again to Fat Cat and all their staff for a wonderful afternoon. Want to book the Fat Cat or charter their catamarans? Contact us, we are happy to help – customercare@mayanriviera.com or 1-888-537-9797. PRICING: $110 per adult, $78 child price aged 3-11. Children 0-2 are free. 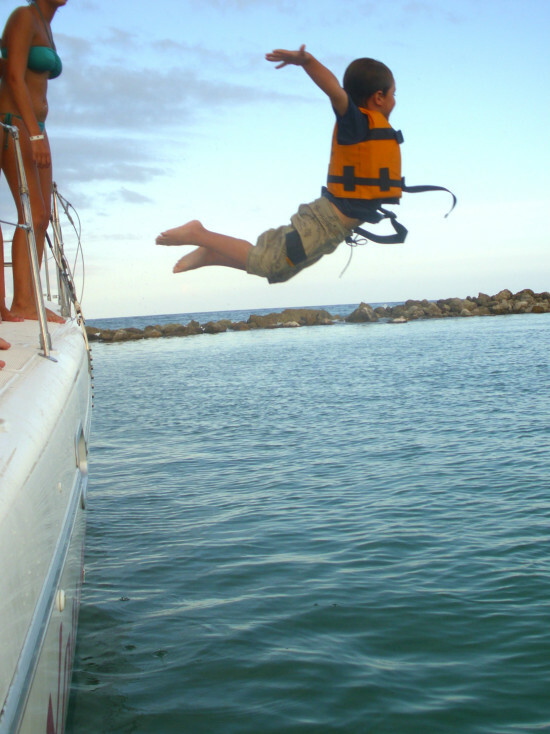 The price includes round trip transportation, picnic lunch, open bar, snorkel equipment and lots of fun.